The perfect assistant for online stock trading! Stock Calculator is a profit/loss and share price calculator application. Stock Calculator is also ideal for performing 'what if' analyses, such as determining what share price a stock needs to attain in order to return a specified profit. When buying stock, Stock Calculator can determine the total cash outlay, per share buying price, or number of shares. When selling stock, Stock Calculator can determine the net profit amount and total return percentage, or the per share selling price. 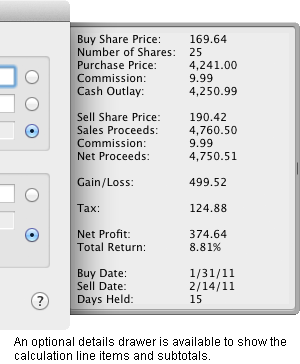 Stock Calculator can optionally include flat rate, percentage, per share, or custom commissions in the calculations. The custom option allows advanced flexibility in defining commission rates. User-defined taxes on the net profit can also be deducted. Calculations can be saved as documents and multiple calculation windows can be open simultaneously. An optional details drawer is available to show the calculation line items and subtotals, and can be printed for future reference. Old-style stock fraction calculations are also supported. Stock Calculator requires requires an Apple Macintosh or compatible with an Intel or PowerPC G4/G5 or processor, using Mac OS X 10.4 or later. The archive file will expand into a folder named "Stock Calculator". To install Stock Calculator, simply drag the folder to your Applications folder. To view the application documentation, choose the Stock Calculator Help command from the Help menu. Help topics include "About Stock Calculator", as well as topics containing detailed information about the application windows and functions. Contextual help is also available for Stock Calculator windows and panels by clicking the Help (?) button. The unregistered version of Stock Calculator will operate for 30 days, and will show the Register panel each time you start the application. Once you have determined that Stock Calculator is operating to your satisfaction, you can register for $9.95 through the online Kagi Store by clicking Register in the Register panel. Kagi accepts credit cards, PayPal, cash, or checks. IMPORTANT: Please include the Computer Name shown in the Register panel with your order. This information is used to generate your registration code. If it is incorrect, your code will not work. After you register, you will receive a registration code by e-mail. To avoid delivery problems with your registration code, ensure that your e-mail system will accept mail from support@sspi-software.com. To enter your code, click Enter Code in the Register panel. Note: The Mac App Store version of Stock Calculator does not allow a 30-day trial period or require registration. 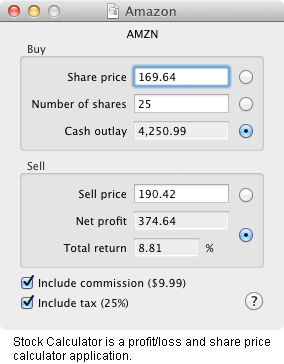 Registered users of prior releases of Stock Calculator can upgrade to Release 2 for an upgrade charge of $5. A product announcement containing upgrade ordering instructions was sent to all registered users by e-mail. Please contact support@sspi-software.com if you need to receive another copy of the ordering instructions. Stock Calculator is distributed on an 'as is' basis without warranty of any kind either express or implied, including, but not limited to, implied warranties of merchantability and fitness for a particular purpose. Corrected document save problem when custom commission and tax rates table entries had undefined amounts. Application re-written as a Universal Binary for native execution on both Intel and PowerPC processors. Multiple calculation windows can now be open simultaneously. Numerous user interface updates and improvements. Corrected problem with Per Share commission rates being ignored for custom commissions. Corrected a problem with calculations when the user's International Numbers preferences do not match the system default. Special thanks to Betty Forlini for help with calculation algorithms and user interface design. Application icon by Alex Forlini. Apple, Mac, and the Mac logo are trademarks of Apple Inc., registered in the U.S. and other countries. Mac App Store is a service mark of Apple Inc.